The former Danneel School caretaker’s cottage on Annunciation Street and a shelter at Audubon Park are two of this year’s “New Orleans Nine” most endangered historical structures, the Louisiana Landmarks Society announced this week. In the late 19th & early 20th centuries, custodial residences were often placed on school grounds. One such cottage is on the corner of Annunciation and Arabella, part of the uptown campus of the Ben Franklin Elementary School. This historic side-gallery shotgun may be older than the original Rudolph T. P. Danneel School c. 1908. 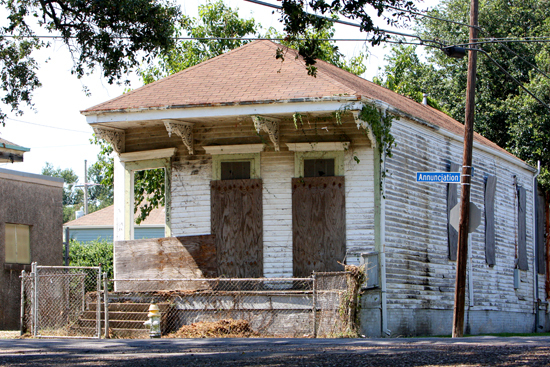 In 2011, the Orleans Parish School Board recognized the “historic property,” “deteriorated conditions” and its “blight to the surrounding neighborhoods.” The Board voted unanimously to transfer this cottage to surplus and issue a competitive Request For Proprosal for its sale and physical removal, but no action was taken. Seven years later, poorly secured, dangerously abandoned and still a public nuisance, this precious historic cottage needs a new and more responsible caretaker. Contact OPSB if it could be you. Shelter 13 at Audubon Park has attracted more recent attention as part of the park’s ongoing creation of a new master plan. Consultants overseeing the planning process initially said they were unsure of whether the shelter should be retained, given its dangerously close proximity to Magazine Street, but their recommendation in the final draft of the master plan is for the Audubon Commission to find a new use for it through a series of public meetings, rather than demolishing it. The concept of Audubon Park as a fun desitnation rather than a place of quiet meditation emerged in the early 1920s. 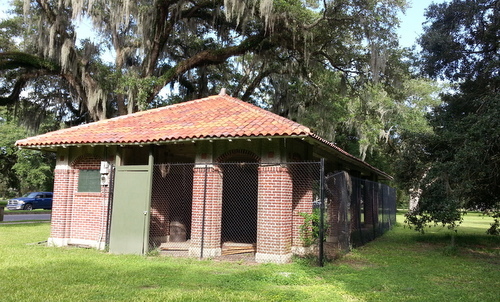 To serve this public use, park planners commissioned various attractions and structures, one of which is the threatened Shelter 13, designed in 1921 by architect Sam Stone, Jr. Also president of the Audubon Park Commission, Stone drew plans for such local landmarks as the Masonic Temple and Maison Blanche. Constructed for restrooms in the busy Magazine Street area, Shelter 13 sits forbiddingly boarded up and fenced in. Current plans do not specify what will happen to this historic remnant but possibilities range from converting it to a security station to demolition. Neighborhood advocates urge its renovation to its public use. Neglected for decades, the damaged lamp stands along St. Charles Avenue and other local thoroughfares mar our picturesque streetscapes. The vast majority of the over 300 St. Charles Avenue cast iron streetlight stands have been left to rust, with missing trap doors, collars and collapsing bases. Some are missing entirely, the stubs of once beautiful lampposts ignominiously marked with orange cones. Installed about 1925 with their original rams’ horn arcs at the top, the lampposts once provided the city with handsome and utilitarian street art. Today, owing to city and RTA neglect, they are literally falling apart. Other sites on this year’s list include Spanish Fort near the lakefront, two historic school buildings, and others. See the full list at the Louisiana Landmarks Society website.